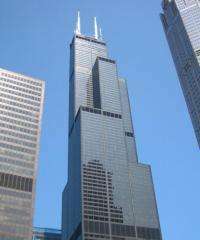 (PhysOrg.com) -- Do you know the Sears Tower? No, no you don't because for some time now it has been going by the much less famous name of the Willis Tower. While that bit of information may not be news to you, especially if you happen to live in the windy city, this next bit will be. The Willis Tower is going solar. Well, at least in a limited capacity. A pilot project is taking place on the 56th floor of the Willis Tower. The standard glass on the south side windows on the building will be removed and replaced with a special photovoltaic glass called Pythagoras Solar's transparent solar windows. 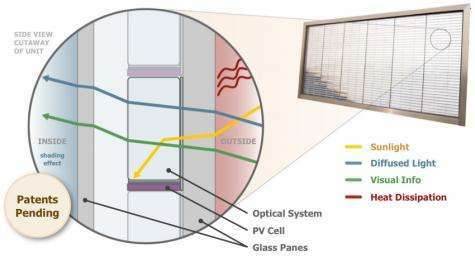 Pythagoras Solar offers transparent and high-density PVGU, which combines solar PV power generation with the modularity and insulating benefits of the standard insulating glass unit (IGU) while preventing direct solar radiation from entering the building. The panels are unique because, unlike other solar panels that lay horizontally, these transparent solar windows makes use of the free space on the side of skyscrapers. The Pythagorus Solar's solar windows are a type of photovoltaic glass that allow diffused light to enter the building, as it would normally, but also uses a prism to reflect sunlight down onto a horizontally hanging PV cell that sits at the bottom of the unit. This system can generate about as much solar power as a standard rooftop-mounted solar cell. Because they diffuse light, the panels will also reduce the amount of heat that comes into the building, and reduce the cooling costs, at least for this floor. If all goes well the project could expand to the rest of the tower. When you consider that the building has enough space to house the equivalent of a 10 acre solar power plant, that is nothing to scoff at. Now can you make the panels less expensive? I'm sure the company that makes them doesn't have to be on the stock market, or whatever. Please use correct language, whether in the technical aspects or the ordinary aspects of the articles. The panels do not LAY, they LIE. @rjsc2000 While I commend your desire to get this innovative solution into the hands of end-users as inexpensively as possible by forgoing stock markets and their spectating speculators, I do need to point out that this tech and all pv tech have high r&d cost's that need to be covered. Thus, spectating speculators or taxes need to cover this r&d cost. As a voter you can help increase the tax payer portion of r&d by supporting taxation or you can insure that only Wall Street reaps the rewards of tech developments through supporting tax cuts. This is your planet, your efforts create profits and taxation so do you want to give everything to the investor class or do you support normal taxation of the rich and reaping the rewards yourself, for your family, and your planet. Currently, the investor class pays to few taxes and this leads to deficit borrowing and billionaires. We need neither, so please raise taxes! The graphic at 1:07 is disingenuous; it compares a 4x increase in power production to a circle with 16x the area of the smaller circle.